I remember when a day at the beach was relaxing – when all I carried was a towel, my car keys, a book and a Macintosh apple. I also weighed 115 lbs. and wore a bikini under a gauzy white shirt. That seems like a lifetime ago, and it was. Now, a day at the beach is an expedition, with hats and umbrellas, extra clothing, sunblock, and food and drink – enough to last several days, if we rationed them carefully. When I told my mother what we cart to the beach, she said, “You’re bringing the whole kitchen!” I didn’t tell her about the small library of books and magazines that I tuck between the towels or the virtual TV set and movie screen available through my i-phone. This weighty accumulation of beach gear started after I was married, and pregnant, and needed more than a Macintosh apple to get me through a day at the beach. We bought a little red cooler that would only fit two sandwiches, two apples and two napkins. My husband carried the cooler and the beach bag that held our two towels and suntan lotion. I carried the bug spray and sprayed him as he called out positions on his body where the mosquitos were landing: My left elbow! My neck! My right knee! Life was still simple and uncomplicated then. When the kids came along, we got a larger cooler to hold all the sandwiches, fruit, cookies and Fritos. We took a 48 oz. thermos full of water, a roll of paper towels and a beach bag packed with beach towels, a change of clothes for all the kids, diapers and wipes for the youngest, sunblock and bug spray. My husband carried the beach bag, the cooler, the thermos, a chair, and our youngest child. The two older boys carried their own towels. I carried the bug spray and a chair. As the boys got older, they took on most of the load, piling stuff on top of their boogie boards as they dragged them through the sand. That still left me with the bug spray and a chair to carry. The years went by, and, soon enough, my husband and I were on our own again. You would think, without the children, our load would have lightened up. Instead, we found ourselves bogged down with so much stuff and not enough hands to carry it. One year, we found beach chairs that had packs built into the back of the seat where we could fit a towel, a book and still have room for more stuff. The chairs had straps that fit over our shoulders, turning them into backpacks. We carried our own chairs, and my husband also carried the cooler, a thermos of water, and our new addition to the beach paraphernalia – a large beach umbrella. About midway through the summer, I began complaining that my chair was too heavy. I was carrying my towel, a small purse, two hardcover books and a few magazines in my chair-backpack. “It’s stopping the blood circulation in my shoulders,” I told my husband. 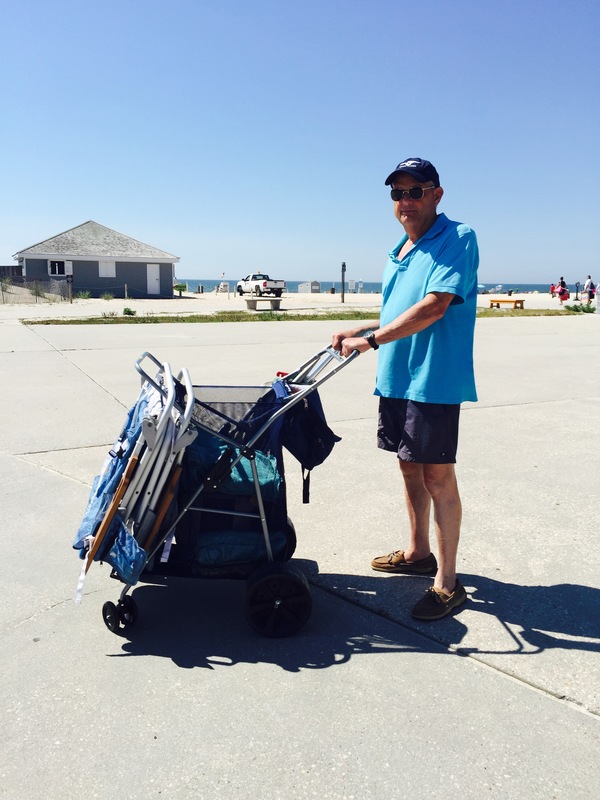 “In this heat, I feel like I might faint.” So he carried my chair in his free hand and tucked the umbrella under the arm that was carrying the thermos and the beach bag. That left me with the cooler, which he eventually took from me when I complained that the ice packs inside were making it too heavy. One morning, we filled a thermos with the leftover breakfast coffee to finish off at the beach. We were hooked. Hot coffee on the beach in the morning, combined with the smell of the cool ocean mist…it doesn’t get any better than that. From that day forward, we added to our beach load: a thermos of coffee, hot cups, sugar, a jar of half and half – and, of course, donuts. So, the medium-sized lunch cooler was retired to a shelf in the garage, and, on our next trip to the beach, we brought a large cooler with outside pockets for our morning coffee amenities – napkins, stirrers and sugar packets. The inside cavity was deeper and could hold our afternoon lunch items, and an extra layer of ice packs and loose ice cubes to keep the beers cold for our afternoon cocktail hour. If we packed it tight enough, we could squeeze in a small jar of mixed nuts to go with the beers! “Is the umbrella too heavy?” my husband asked. “Give it to me,” he said, holding out his hand. I gladly gave it up and he tucked it under his arm. I watched his back as he walked ahead of me. Both shoulders had stuffed beach chairs on them. One hand held the overstuffed beach bag; the other held the oversized cooler with the umbrella tucked under his arm. He was a beast of burden, carrying the load for both of us, but I was the only one complaining. “What am I supposed to carry?” I asked. “Everything is in the cart. That’s the whole idea.” Then I twirled around on my toes with my arms spread out. “I carry nothing,” I said. “OK. Then why don’t you pull it?” I told him. We continued “discussing” the matter while my husband trudged through the sand, pulling the cart in front of us. At the end of the day, we packed up the cart and my husband began pulling it back through the sand. My son ran over and tried to pull it away from him and the two of them tugged and pushed, in a struggle for control over the beach buggy. “I’ve got it,” my husband said. “No; I’ve got it,” my son said. My husband finally surrendered and walked with me behind the cart. “You know, we really bring too much stuff to the beach,” I said. I can’t say that I blamed him, but I also wasn’t about to start hauling heavy sacks on my back, like a pyramid builder, or dragging coolers through the hot sand. Now that sounds like an excellent plan! Why didn’t I think of that? This entry was posted in Uncategorized and tagged Beach, Beach buggy, Humor, summer. Bookmark the permalink. I loved it especially after seeing that beach buggy. Try roughing it up next time with black coffee some dry crackers and a beach towel to share.Ha ha. Every family that goes to beach can give a big nod to this story. It is like a verbal movie film of a day at the beach – unfolding subsequent visits that show how we all increase what we bring ad absurdum. You mirror all of us and we have to see ourselves as we really are!